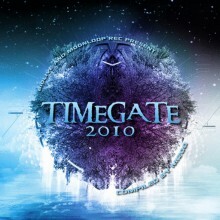 Biolive in collaboration with Moonloop Record is very happy and proud to present you the first ever Biolive compilation, « TIMEGATE 2010 », compiled by DJ Mizoo. Biolive is a major psychedelic events promoter in Switzerland, especially known for its full blast decorations during new year's eve mega psychedelic parties « TIMEGATE ». This compilation is a complete party bottled in an 80 minutes CD, presenting you artists who played or will play at this year's edition of Timegate, both well established international musical projects and Swiss uprising artists, taking you from deep downbeat to nocturnal psychedelic tones, passing by floating and groovy progressive. As it says, it is an « all occasion » CD aimed at eclectic psylovers who like to listen to the whole spectrum of psychedelic electronic music, and we know this is a majority of party goers. Join us in this orgasmic mind revealing journey and just drop into the sound!